Labeled the best short-stop in Miami history, the Trento New Jersey native was the Hurricanes' driving force to their first College World Series appearance and subsequent runners-up finish in 1974. In his three-years, Krenchicki set a UM career records for his hits (204) and runs scored (145) as well as seasonal marks for doubles (17, 1975) and total bases (117, 1975). In all, he hit .316 (198 of 626), slugged for a . 436 percentage (273 TB), swiped 67 bases and rapped 35 doubles, 11 triples and six home runs. His 63 base knocks as a freshman set a Um freshman record, but before that, the left-handed hitter was turning heads. At the 1973 World Amateur Tournament, he was the tourney's second leading batter with a .394 average as the USA team's shortstop. As an eighth- round draft choice of the Philadelphia Phillies out of Trenton's Ewing High in 1972, Krenchicki opted for Miami and the pursuit of a Physical Education degree. 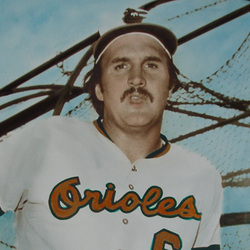 Following the 1975 season, he was selected in the secondary phase of the January, 1976 draft by the Baltimore Orioles He made his big league debut two years later. Krenchicki totaled eight-years of major league service (through 1986) at Baltimore, Cincinnati and Montreal. In 550 games he batted .266 with 44 doubles, five triples, 15 homers with 124 runs batted in and was charged with just 35 errors in over 1,100 fielding chances. He played with Bradenton of the Senior Professional League with former UM teammate Orlando Gonzalez and makes his home in Bradenton.